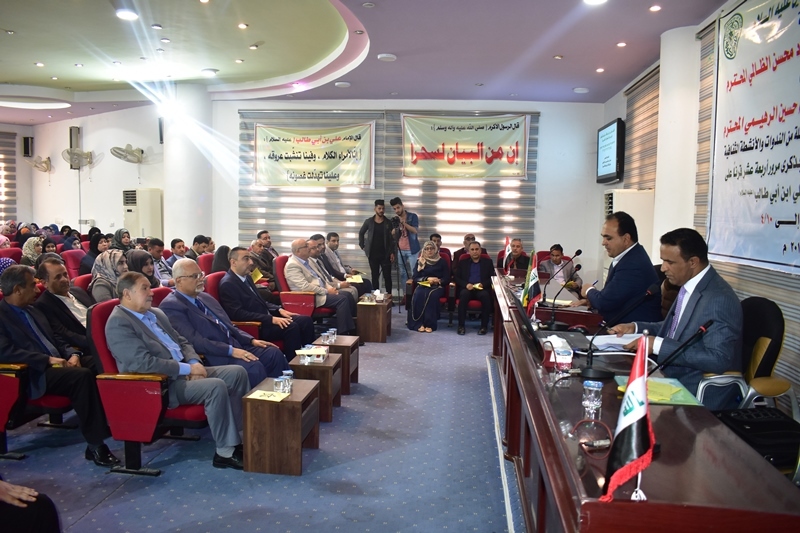 The seminar was moderated by Prof. Naseer Al-Kaabi and lectured by Prof. Dr. Star Abdul-Hassan Al-Fatlawi from the Faculty of Archeology, Qadisiyah University. The researcher has highlighted the statements that is made by Imam Ali (peace be upon him) in the printed Hebrew knowledge circles during the past 30 years, as well as the selection of texts translated from the Old Testament for the reference and gospel of the Holy Prophet and Imam Ali (peace be upon him) In the Hebrew books according to various axes, including its origin and its relation to the Prophet Muhammad, his marriage and his successor, which contained a lot of fine details and the differences that has grown between the supporters and the dissent and schism between the Shiites and Sunnis since then, as Imam Ali (peace be upon him) is the legal heir of the Prophet Muhammad (R). At the end, the dean has presented a certificate of appreciation for the scientific lecturer in appreciation for his efforts.